Edinburg Vela's Cristian Flores looks for running room against Laredo United defender Oscar Mejia during the second quarter at Richard R. Flores Stadium on Friday, Aug. 30, 2018, in Edinburg. The No. 1 and No. 2 teams are set to meet this week, and a little bad blood never hurt a great matchup. No. 1 Edinburg Vela hosts No. 2 Brownsville Hanna at 7:30 p.m. Friday at Richard R. Flores Stadium in Edinburg. The game has been selected as The Monitor’s Game of the Week. The bout is a rematch of last year’s instant classic bi-district playoff game. Vela and Hanna faced off on Nov. 17 in Edinburg. Hanna jumped out to a 7-0 lead in the first quarter before Vela reeled off 28 points to take a commanding lead into halftime. Hanna bounced back in the second half and led by one point as Vela took possession of the ball for the final drive. A 54-yard walk-off field goal from senior kicker Austin Garza sealed the 34-32 win for Vela. Both teams have changed this season. The biggest question for Vela heading into Friday is who will be under center. Sophomore A.J. Sotelo started for Vela last week against Laredo United, but he was pulled at halftime in favor of Elijah Trujillo. Vela proved against United that the team is ready to dominate this season, the same way the SaberCats have over the last few years. Vela ran for 225 yards and totaled 366 yards of offense, beating United 48-27 in the Thursday night opener. Hanna started the season with a statement. Coming into Week 1, Hanna was ranked fifth in the RGVSports.com poll, and McAllen Memorial entered the year at No. 3. When they clashed on Thursday night, Hanna jumped ahead, leading 14-6 after the first quarter. The Golden Eagles never looked back against one of the most consistently dominant Valley teams, winning 49-28. Junior quarterback Victor Campos completed 11 of 15 passes for 190 yards and 2 TDs. Senior back Cesar Mancias picked up right where he left of after running for more than 1,000 yards as a junior. On Thursday, Mancias ran for 207 yards and 3 scores. 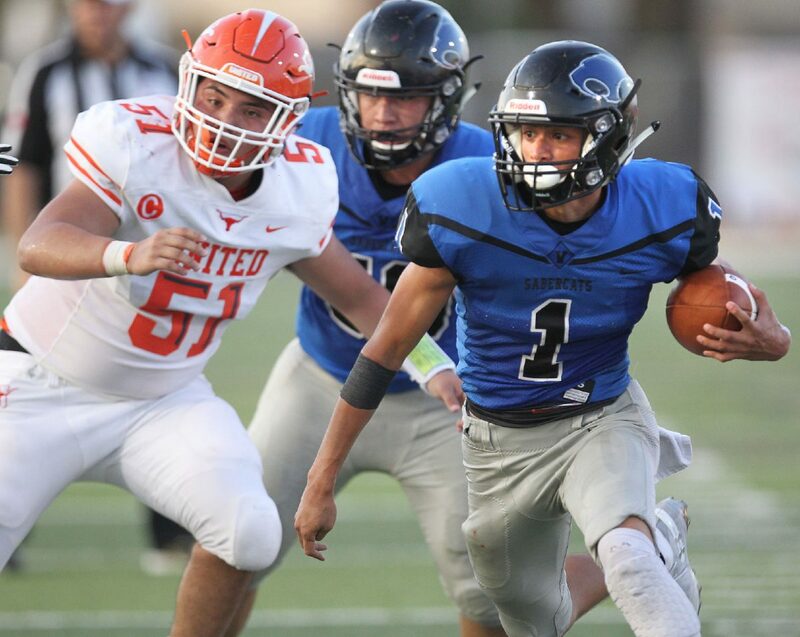 The Vela defense will have to rely on its steady presences in the middle — senior defensive lineman Sergio Carrizales and senior linebacker Luis Gutierrez — to slow Mancias. Senior Daniel Enriquez kicked his season off with a bang, returning a kickoff 99 yards for a touchdown against United. Hanna will have to be very careful kicking to Enriquez, but he’ll probably find the end zone regardless of what the Golden Eagles do. Enriquez opened the scoring for Vela in this matchup last year with a 70-plus yard punt return touchdown. Both teams are desperate to pick up the win, because both face a murderer’s row in non-district play. Vela will face McAllen Memorial and Los Fresnos — two playoff teams — after the matchup against Hanna. Hanna will face Weslaco East, Sharyland High and Tascosa after the game against Vela. Most likely, the team that wins will stay at the top of the poll, while the loser may slip a bit in the rankings.